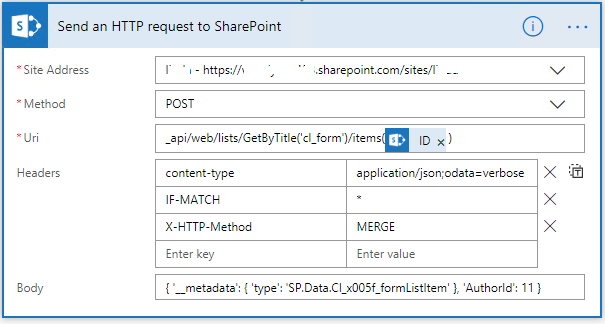 Is it possible to update SharePoint Online build-in fields (like "Created by") by using Microsoft Flow? When creating a new flow and using step "Update file properties", I can only select values to be updated for Title and newly created custom fields, but there are no possibilities to update built-in fields. Is it possible at all? You can update the Author (Created By) or another field by using REST API _api/web/lists/GetByTitle('<list>')/items(<item id>) and send POST request in the flow. By default, the Author is read-only field. You need to change the attribute ReadOnlyField to false for this field. You can post to: /_api/web/lists/getByTitle('<list>')/Fields('<fieldguid>') and update the field ReadOnlyField to false. After that, the field value can be editable. Not the answer you're looking for? Browse other questions tagged sharepoint-online column flow update or ask your own question.